Pet owners and pet share a special type of bond, that only an animal lover can understand. Our pets are a part of our family. When one of our pets pass away the grieving process is the same as a lost family member. Our loved friends have been with us for sometimes their entire life always giving us unconditional love in return. Honoring their memory after their passing is an important way to memorialize their love for us. That is why ChristyAl Plaques & Engraving are helping animal lovers cherish their pets after they have passed away. 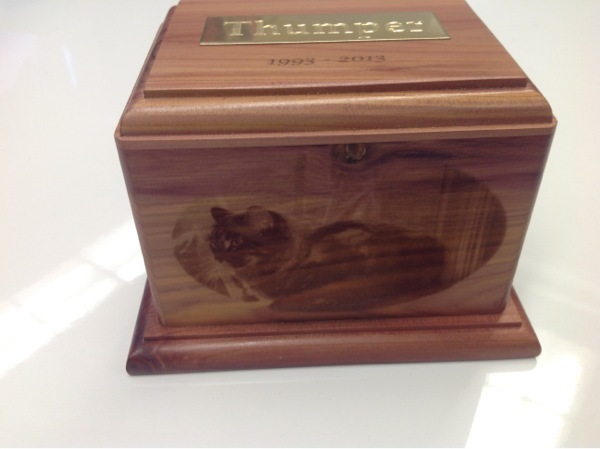 We offer pet markers, memorial stones, and pet urns, in marble, granite, wood, and glass. Nothing captures memories like a photograph. We are able to laser engraved photo-quality pictures in all of the above-mentioned materials. For all that your pet has done for you, keep their memory alive forever with a beautiful memorial. For every pet memorial that we sell we are donating five dollars back to animal rescue. We do that so you're passing loved one will help keep another future friend alive. Are you an animal lover? Have you lost one of your friends? How did you grieve for them? Please comment I would love for you to share your thoughts. This picture is our friends cat that just passed away I laser engraved the date and the picture on the side of this beautiful wooden urn.